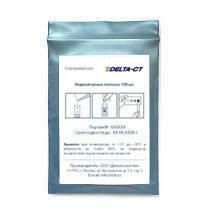 Chlorine dioxide test strips | ООО "Дельта хим-тэк"
Chlorine dioxide is a frequently used disinfectant. Due to its measuring range the test is especially suitable to check the presence of effective levels in chlorine dioxide based disinfectants. Method of application: Dip test strip into solution to be tested for 1 second and remove. After 30 seconds compare test strip with colour scale to determine the test result. Storage: Avoid exposing the test strips to sunlight and moisture. Keep pack cool and dry (storage temperature not above +30°C).